Abbe Refractometers for low refractive index and high refractive index measurements In addition to our standard Abbe Refractometer NAR-1T, 2T, 3T, 4T and DR-A1, we can supply the following Abbe models. We shall ask you to use them if the specifications of our standard Abbe Refractometers do not meet your requirements. Another Optional * We can supply Abbe Refractometer with measurement range of "nD 1.7000 to 2.0800" and with Measurement Temperature Range of "0 to 50˚C" or "0 to 120˚C". 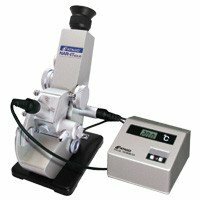 Note : You are requested to convert measured refractive indices to "real refractive indices" (with referring to conversion tables), since the above Abbe Refractometers have the same scales as our standard Abbe Refractometer NAR-1T and 2T.